Here's a pretty clear version of "The Dunk on Lebron"
Check it out, see what you think. I'd say that a pretty good poster. Atlanta Hawks trade Acie Law and Speedy Claxton to the Golden State Warriors for Jamal Crawford. The Hawks managed to give away two guys they never really use for a proven and deadly scorer. Since his days on the Bulls, I have been a fan of Jamal Crawford. At 29, he's currently ballin' in his prime, and will provide Atlanta with some extra firepower from beyond the arc. The only thing I'm wondering about is how he's going to fit into the rotation; the Hawks just inked Bibby to a four-year deal, clearly making him the starting PG for the foreseeable future. Even though Joe Johnson has gotten flak over his ability to lead a team, he's still the Hawks most well rounded player and top dog. The way I see it, Jamal is going to have to come off the bench. And the Warriors? Let me put it this way; I doubt you or Golden State will care much for him this next season. Fantasy Relevance: The player that will take the biggest hit with Crawford in town is Flip Murray. Flip played well as 6th man last season, but with the way the rotation is rounding out, he'll be the first man out. Aside from that, don't expect Crawford to be as consistent as he was last season. 15 shots with 19 points a game are going to be hard to come by when you've got as many weapons as Atlanta. Toronto trades Shawn Marion, Kris Humphries, and Nathan Jawai to Dallas for Devean George and Antoine Wright. Toronto also acquires Hedo Turkoglu from Orlando for cash and a future pick from Memphis. Too many parties involved with too many irrelevant players changing places. The only two people that matter here are obviously Shawn Marion and Hedo Turkoglu. It seems like it's been forever since the Matrix was running and gunning next to Steve Nash and the Suns. Since then, Marion has fallen a bit into obscurity. He's failed to make favorable impressions during his stops in Miami and Toronto. And now a few years removed from the last season he's played more than 70 games, he seems to be but a shell of his former slam-dunking self. But looks can be deceiving. Despite his struggles over the last few years, Dallas is raving about this acquisition. Marion gives the Mavs that extra versatility they haven't had in a long time; he scores from inside and out, rebounds extremely well for a man of 6'7", and can defend four positions. Take a look at the Mav's lineup for next season: Kidd, Josh Howard, Marion, Dirk, and Dampier (...ok so Dampier isn't really that impressive). Jason "The Jet" Terry remains their sixth man, and they've got Barea/rookie summer league standout Rodrigue Beaubois to back up Kidd's aging legs. A pretty solid rotation if you ask me. The Raptors weren't half bad either; Turkoglu opens up a number of more options for the Raptors' offensive attack. He's a crafty guy that can light it up from downtown, and can also take it to the rim. The Raptors also have a pretty nice looking rotation heading into next season. They've got a nice combination of scoring and assists in their two headed point guard of Jose Calderon and newly signed Jarret Jack. At the two, they've got human highlight machine Demar Derozan. Hedo comes in to fill the three. And they've got twin towers in Bosh and Bargnani to anchor the paint. In the wackness that is the Eastern Conference, this team definitely has a legit chance at making some noise in the playoffs next season. Fantasy Relevance: Marion isn't going to become Matrix circa 2005, but I'm pretty sure he's going to put up a better all-around statline than the ones posted in the last two years. He's never been a guy that's needed plays run for him to be effective, and I expect that to remain the case. He's going to find ways to contribute on both ends of the floor without getting in his teammates way. Things are looking up for this guy. I'm not entirely sure if he'll be worth a 2nd round pick, but if he's available in the third, his potential makes him worth taking a risk on. The same can be said for Hedo. He was brought into Toronto to score down the stretch, and that's exactly what he's going to do. His inside-outside abilities will compliment Bosh and Bargnani very well, seeing how they both can also stretch defenses away from the paint. Expect him to maintain his 16-5-5 averages from last season without screwing over anyone else. You can draft Raptors with peace of mind. The NBA's top team just got better. Relatively speaking, his antics have cooled off a bit (but that Michael Jackson tribute was real creepy). And the fact of the matter is that Artest is an offensively capable SF that defends with a tenacity that most other players can't, or choose not to do. On offense, he's another guy that the Lakers can toss the ball to when Kobe gets doubled. Artest's jumper is sufficient, and also does a good job of getting to the rim. On defense, he's going to be the guy that sticks the opposing team's best man. This allows Kobe to save his own energy for the offensive end. If he manages to assimilate into the Lakers chemistry-wise (a big if), I don't see any other team being able to take the title from them in summer 2010. Fantasy Relevance: Artest is NOT going to get the 15 shots he got last year in Houston. LA is Kobe's team, and Ron Ron better be ready to play 3rd or 4th fiddle in terms of offense. Expect his 17ppg to drop to somewhere around 13ppg. He'll get his minutes, just don't expect the stats. Houston is now a tossup. Guys like Brooks, Wafer, and Ariza will be looked to for points. Keep an eye on all of them in the latter rounds of your draft. It's too bad he never panned out in Detroit. Tall and athletic, he just couldn't stay out of foul trouble. Hopefully he gets some serious minutes with Jennings over there in Milwaukee. I wish him the best. I can see it now: all of Madison Garden chanting "Darko! Darko! Darko!..." I can't wait. In all seriousness though, he's got a chance at getting a good 15 minutes at the center position each night. He's only competition is a slimmed down Eddy Curry and unknown Mouhamed Sene. Otis Thorpe pulled a nice one on Dallas. And now he's got a legitimate power forward to help Dwight Howard out on the boards. Bass is one of those guys any coach would want on their team. He works hard and puts the team first. The Clippers do something right for once. Z-Bo can go get his 20-10 in some other town. Someone on the Cavs not named Lebron has a chance to be in some SportsCenter Highlights. ...ok I actually really like this move. Moon gives some depth behind Lebron at the SF slot. Though he's raw on offense, he's still long, freakishly athletic, and a capable defender. He's no Artest or Bowen, but he's a great addition. Came across this video today on Youtube - a must see for any Jordan fan. Coming from a fanatic, trust me when I say it's worth your time to watch. There's a lot of good footage that you don't come across in most Jordan highlight clips. It seems like every other time I check ESPN.com a new trade just went down, or a free agent has switched teams. All this player movement means shifts in the NBA Power Totem-Pole. Almost as nearly important, transactions means shifts in player fantasy basketball valuation. In an attempt to prepare you for your league next year, this is my 2 cents on what's happened so far. As much as I hate them, I have to respect the Spurs. They've managed to acquire an athletic, offensively gifted forward while only giving up three veterans in the waning stages of their careers. Riddled with injuries last season, San Antonio recognized that they had a hard time scoring when one of Duncan/Ginobili/Parker were out. Given Manu's penchant for injuring himself and Duncan's gradual decline into middle-age, upper management reached out to nab some very talented insurance. If Duncan stays healthy, this is a very deadly squad in the wild west. The Bucks? They did this purely for financial reasons. Fantasy Relevance: Though Jefferson's stats will most likely drop from last year's levels, I expect him to hover around 16ppg with 4 rebs a game. RJ is capable enough on both ends of the floor, and will still get his 30+ mins a night. Additionally, his production depends much on the health of Duncan/Ginibili/Parker. If one of them go down, his numbers will be the first to go up. Because of age, I also think Duncan will be relied upon a little less on the offensive end now that RJ is in town, but I still expect Duncan to put up 18-10 consistently. Minnesota T-Wolves send Randy Foye and Mike Miller to Washington for #5 draft pick (aka Ricky Rubio), Etan Thomas, Darius Songaila, and Oleksly Pecherov. The Wizards on the other hand got a nice deal here, and addressed one of their weaknesses for the past many years: depth. Foye, cursed with having a shooting guard's mentality in a point guard's body, now has a chance to play protege to one of the league's best shoot-first point guards in Gilbert Arenas. Mike Miller, known for his long-ball, put in one of his worst statistical seasons in 08-09. If the change of scenery (and maybe some wins) can motivate him into playing the high quality basketball that earned him a spot on the USA Basketball Team in 2007, he will provide the Wizards with some offensive firepower outside their Big Three. Fantasy Relevance: Rubio is the only player that has a remote chance of having fantasy value out of the players the T-Wolves received, and he might not even play in the US this year... so don't bother with those guys. On Washington's side, Foye and Miller might have some highlights throughout the year, but Washington has too many offensive weapons for them to consistently put up any more than ten points a night. Foye and Miller are going to be on and off the waiver wire this year. 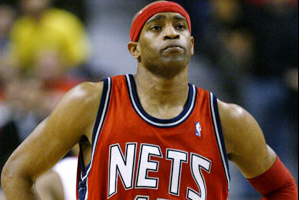 New Jersey trades Vince Carter and Ryan Anderson to Orlando for Rafer Alston, Courtney Lee, and Tony Battie. So far, this is my favorite trade of the off-season. With Hedo Turkoglu's inevitable leave approaching, Orlando went out and brought back the original Half-Man, Half-Amazing. Though he's nowhere near what he used to be, VC is still an upgrade over Hedo. Vince can do everything Hedo did, and he can do it better. Now in the latter half of his career, he has a legitimate opportunity to add a championship ring to his trophy case. Though Alston played well in the playoffs, he was expendable with the return of Jameer Nelson's return - and Anthony Johnson is adequate as a backup point guard. Orlando is reloaded and ready for another run at the title. ...And now for the other side. It's clear that New Jersey is now rebuilding from the ground up, and they've got a great backcourt to build around. Devin Harris proved last year that he's a star-caliber player. Newly acquired Courtney Lee, now entering his 2nd season, played with the poise of a veteran at multiple points throughout the season. He's athletic, commits to defense, shoots well, and plays smart. Though they might not win many games next year, Harris and Lee make Net's games more than worth it to watch. Fantasy Relevance: I see Vince's numbers dipping ever so slightly; Orlando is a loaded team. However, I think the one that will be affected most is Rashard Lewis. You know Dwight Howard will continue to get his touches, given his Superstar status. Jameer is also still young and on the rise. Thus, it's Rashard's touches that will decrease. In NJ, you can expect Courtney's 8.4ppg, 2.3rpg, and 1.2apg to all at least double. He's bound to struggle a bit with a lot more responsibility on his plate, but I expect him to rise above all that. Keep an eye on Lee in the mid to late rounds of your draft.